Win these brownies and cookies! You could purchase brownies like the ones in the post below. Or you could take our Brownie Trivia Quiz for a chance to win the brownie and cookie gift box at the left, in our weekly Gourmet Giveaway. You don’t have to answer the trivia questions correctly to win; but win or not, you’ll pick up some great brownie trivia. 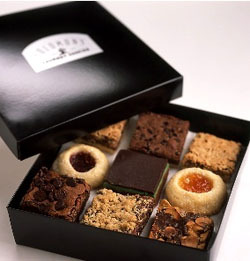 We love the prize, Solomon’s cookies and brownies—read our review. They’re even kosher. So trivia fans and brownie fans: Head on over to THE NIBBLE’s Gourmet Giveaway, take the Brownie Trivia Quiz and check out the upcoming trivia quizzes. There’s a new one each week. Now there’s a socially-responsible reason to buy a dozen tempting brownies. When you buy them from Greyston Bakery, you can indulge both your sweet tooth and your good will—you’ll be supporting this inner-city bakery in Southwest Yonkers, New York. Profits go to community development initiatives, including low-income housing, childcare, health services and technology education, and the business provides jobs in an area where there is a high concentration of hard-to-employ individuals. Ben & Jerry’s is a big supporter: The ice cream titan, known for its support of social causes, serves Greyston brownies exclusively. The delicious brownies and blondies can be ordered online at GreystonBakery.com. One dozen brownies (Blondie, Chocolate Fudge, Espresso and/or Walnut, available in individual flavors or as an assortment) are $32. 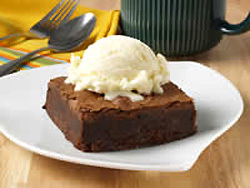 The brownies, made of top-quality ingredients, are sweet and buttery. We especially enjoyed the blondies. Little figs filled, with clove ganache and enrobed in chocolate. Halloween is just days away. While there may be some who hanker for the miniature candy bars of youth, we have a much better recommendation. One of the delights we look forward to each fall is a box of chocolate-covered figs from John & Kira’s, one of our favorite artisan chocolatiers. John & Kira’s makes two variations of these confections, using sweet, fragile calabacita figs from Spain. 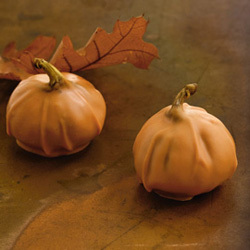 The Fig Pumpkins, are dipped in a thin layer of white chocolate and tinted a perfect shade of pumpkin. They’re a seasonal special, but Dark Chocolate Figs are available year-round. The Fig Pumpkins are filled with a delectable whiskey clove ganache, the Dark Chocolate Figs with a pure dark chocolate ganache. We flip for these little figgies. Putting one at each place setting at Halloween or Thanksgiving, serving them with after-dinner coffee or bringing a box to your host(ess) is certain to delight. And don’t forget to send a box to that bewitching someone special. Read the full review. Rockwell Associates made it even more so. Lunch fun, anyone? Through November 2nd, everyone in the Big Apple can take ephemeral joy in the pop-up restaurant concept from Bon Appétit magazine. Featuring fine casual cuisine from some of the nation’s top chefs, who also participate in daily demos and tastings, it’s a foodie vacation. Get to work early and break for a long lunch; watch the presentations as you enjoy your soup, salad and dessert. Or, just pop in for a quick sandwich or a cup of coffee and a brownie, and catch one 15-minute demo. Come back the next day for a completely different experience. If you can’t stay to watch, you can get your food to go. The Café enables food enthusiasts to taste the casual fare of great chefs, see them give demos in an intimate arena, get up-close with Q&As and book signings. 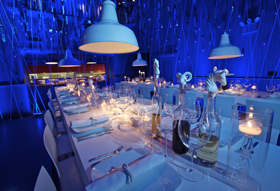 (The Supper Club portion is booked for private evening events). Each day, there’s a selection of noteworthy fare from chefs Govind Armstrong, Cat Cora, Emeril Lagasse, Giada De Laurentiis, Michael Mina, Michel Richard, and pastry chefs Claudia Fleming, Wil Goldfarb and Pichet Ong. There’s a free walk-around tasting on the balcony overlooking the room: Woodbridge Winery is pouring its current releases, Häagen-Dazs is sampling its excellent Reserve ice creams and Ghirardelli chocolate is offering Intense Dark chocolate line samples that go nicely with the Woodbridge reds. We had a great first day, and hope to get back as often as we can before the Café disappears into memory at the end of lunch on November 2nd. Pop in at 221 West 57th Street between Seventh Avenue and Broadway, weekdays from 11 a.m. to 3 p.m. Warning: the Daily Specials were sold out by 1 p.m., so earlier is better. For more information and a schedule of events, visit BASupperClubandCafe.com. Feeling rich or reckless? Hankering to buy a voluptuous gift for yourself or your BFF (best foodie friend)? The French truffle season opens the last week of November. In the Périgord, the world’s greatest black truffle region, pigs, dogs and trufflers (human truffle hunters) will beating the bushes (or more literally, the forests of great oak and chestnut trees) for the precious fungus. While most connoisseurs pledge their troth to the white Alba truffle of Italy, we have always loved cooking with the Périgord truffle (the white truffle can’t be cooked, just grated over food). 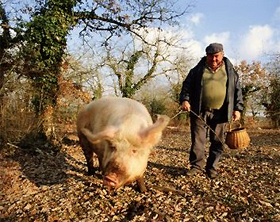 Two Périgord truffle hunters: man and pig. QuelObjet.com flies fresh black truffles directly to the U.S. from the Périgord, and will overnight express them to your doorstep. But orders must be placed in advance: They only import what has been ordered. To learn more about truffles, read our overview article, complete with a Truffle Glossary, recipes and some beautiful truffle photos. Truffles are found four to five inches underground, growing on the roots of oaks and a few other trees. Since they can’t be seen, they need to be sniffed out. Pigs have great noses for locating truffles and will naturally root them out. But pigs love truffles as much as we do, and will swallow them on the spot if they are not restrained (and as you can see from the size, it takes a tough man to restrain a large pig). Dogs, which can be trained to find truffles, but have no interest in eating them, are the preferred scout of most trufflers. P.S. If you plan a truffle feast…please invite us.